On Tuesday, December 4, 2012, the United States Mint began accepting orders for the last America the Beautiful Quarters Three-Coin Set of the year. 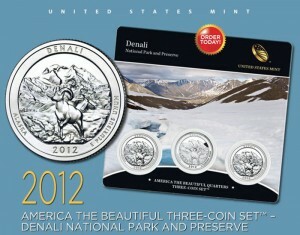 With coins honoring Denali National Park and Preserve in Alaska, the numismatic product has a price of $9.95. Each of the coins are held within an attractive display card that includes an image of Denali National Park and Preserve and a United States Mint Certificate of Authenticity. Including this latest set, there is a total of fifteen that have been issued since the America Beautiful Quarters kicked-off in 2010. All fifteen may be ordered directly from the U.S. Mint, albeit at different prices. Three-Coin Sets prior to 2012 cost $14.95 each. The U.S. Mint accepts orders via the its online catalog on this U.S. Mint product page, and at 1-800-USA-MINT (872-6468). Denali quarters were released into circulation on November 4, 2012 and also offered on the same date in varying quantities through U.S. Mint sales of quarter bags and rolls. Featured on the coin’s reverse is Susan Gamble’s design depicting a Dall sheep with Mount McKinley in the background. Inscriptions include DENALI, ALASKA, 2012 and E PLURIBUS UNUM. As is common to all America the Beautiful Quarters, the obverse features John Flanagan’s 1932 portrait of George Washington. Inscriptions include UNITED STATES OF AMERICA, LIBERTY, IN GOD WE TRUST and QUARTER DOLLAR. Each year the U.S. Mint releases five new quarters with different reverse designs that honor a national park or site in the United States or one of its territories. The program debuted in 2010 and it will continue until at least 2021. The order in which the designs appear corresponds to the order in which the selected site was first established as a national park or national site. Denali National Park and Preserve was established on February 26, 1917. Past 2012 America the Beautiful Quarters include those celebrating El Yunque National Forest of Puerto Rico, Chaco Culture National Historical Park of New Mexico, Acadia National Park of Maine and Hawai’i Volcanoes National Park of Hawaii. 2011 America the Beautiful Quarters honored Gettysburg National Military Park in Pennsylvania, Glacier National Park in Montana, Olympic National Park in Washington, Vicksburg National Military Park in Mississippi and Chickasaw National Recreation Area in Oklahoma. 2010 America the Beautiful Quarters featured designs depicting Hot Springs National Park in Arkansas, Yellowstone National Park in Wyoming, Yosemite National Park in California, Grand Canyon National Park in Arizona and Mount Hood National Forest in Oregon.